A door is the first thing guests will notice when the visit your Toronto home. Make sure you make a great impression with a new replacement door from Doors Repair Toronto. Doors Repair Toronto can replace your old doors with new energy saving doors that will increase the beauty and security of your home. We carry many styles of doors, from entry to sliding patio, and our trained and experienced craftsmen can provide the high quality door installation your home deserves. We install doors from only the top door manufacturers including Pella, Andersen, PlyGem and Simonton. Additionally, we are one of Toronto’s only Pella Certified Contractors. Toronto Door Replacement can help you reduce your energy costs by installing an energy efficient door on your Toronto home. We have been providing quality service on all major and minor door projects in the Toronto area for more than 25 years. Our experience ranges from storm and entry door installation in any type of home and we can install any type of replacement door. Whether you own a home or business, Toronto Door Replacement is ready to help. For more than 25 years,Toronto Door Replacement has provided a variety of door repair and installation services to clients across GTA Ontario. We offer commercial and residential services to homeowners and businesses throughout the greater Toronto /Metro Area. From installing automatic glass doors for supermarkets, to simple sliding patio doors for homes, Toronto Door Replacement has got it covered. And because our service trucks come well-stocked with parts, it means that most repairs can be done the first time we visit. In some cases, in less than an hour! Please call us now (647-866-0956) Toronto Door Replacement for a free quote on our repair services within the Toronto metro area, or for more info. You may also complete the easy service request form at right for a free quote on our services. We specialize in commercial size doors & Locksmith. We are a distributor of many brands of hollow metal frames & doors, wood doors, fire rated doors, access panels, door hardware, Lockets, glass, bathroom accessories and more. Some of the brands we carry include but are not limited to are: Daybar, Schlage, Cal-Royal, Doormerica, Pemko, Tell, PDQ, Rockwood, Sargent, Harney, and Eliason. We also offer great service and competitive pricing. Toronto Commercial Door & Locksmith also have a terrific team of installation technicians, who work out in the field daily. We provide quality installation services for commercial doors and commercial hardware. Our technicians are experienced in installations in many fields including: build-outs, industrial buildings, private commercial construction, the medical industry, public and private government sectors, higher education facilities, ground up hotel and office buildings, restaurant and retail build-outs and more. Our team of installation technicians, are qualified to handle a variety of situations. We have the experience and knowledge to ensure that the doors on your commercial property are installed and working properly. If we cannot fix it, we can give you a quote to replace it. Commercial door installation requires a professional installer to ensure that your property’s access points are functioning properly and meet certain safety standards. Our company did not set out to be the biggest commercial door company. We set out to be the Best! We provide quality products with professional results. Our employees are the key to our success. It is our technical expertise, unwavering customer focus and years of experience that make Toronto Commercial Door & Locksmith the Best of the Best. Whether it’s the entry door that rests at the front of your property or one of the many that allow you to move between rooms, your home’s doors are an essential part of your life. In addition to keeping you safe, they maintain privacy, and help improve your home’s curb appeal. At Toronto Door Replacement, our door installers have years of experience. As such, they have the skills required to work with properties of all types. Whether you’re in need of sliding doors that’ll lead to your yard or a new entry door with a fresh locking system, we’re the team for your job. In addition to providing doors that make your property secure, we want to ensure your home is eco-friendly. Similar to windows, doors that don’t fit properly can make your energy bills soar. Years of exposure to heat and moisture cause wooden doors to rot, warping the material and allowing drafts to flow through. As experts in the area of residential door installation, we can identify the problems you’re currently experiencing and address them with a new door that compliments your home. Did you know that there are various door installation types to choose from? Finding the right one for your property is critical for several reasons. From matching the tone of your property’s design to finding a fit that keeps you secure, our expert door installers are here to help. In addition to providing lots of different door types, we work with high-end brands. 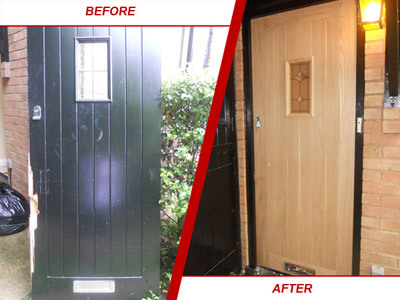 As such, you can rest assured you’ll benefit from our residential door installations for years to come. Once you’ve chosen the Toronto Door Repair team to install your doors, we’ll visit your home to take some measurements. From there, we’ll create the right doors for your property and contact you to set an installation date. We understand that you want to complete your project quickly, which is why we use the most efficient processes for your door installation needs. At the same time, we never compromise quality. As such, your results will last for many years to come. To ensure this happens, our Install Manager will take a final walk through of your property to make sure everything meets our high standards. This is a method of installation where the windows are installed and attached directly to the structure. Our installation teams are made up of professional craftsmen who take pride in the work they perform. Through the entirety of the Doors replacement process, Toronto Door Repair will be communicative, honest, professional, and responsive. We have found that these traits allow us to fulfill our mission to you: that you will become a lifelong Toronto Door Repair customer. You may call us at (647) 866-0956 to discuss any one of these types of Doors installations for your window replacement project.